> Blog > Will my cellular carrier pay to solve my cell signal problem? Will my cellular carrier pay to solve my cell signal problem? The major carriers spend nearly $50 billion each year on improving their networks, but cellular service continues to be a challenge for many businesses. And it’s not just remote locations that have trouble getting adequate cell reception. Large, commercial buildings also struggle with weak or nonexistent indoor signal due to building materials that block cellular frequencies. Cellular carriers often won’t spend the time and money to solve a single customer’s cell reception problems, especially if outside signal strength is adequate and it’s the building itself that’s causing the problem. Instead, they might recommend installing a “small cell” inside the customer’s building. A small cell is a low-power base station that covers a limited area—essentially, a miniature cell phone tower. For small-to-medium sized businesses, a small cell is likely going to a femtocell. Most carriers offer femtocells to small businesses and individual customers, typically for a one-time fee, when they complain about poor or non-existent cell signal. A femtocell is a unit that’s about the size and shape of a cable modem or WiFi router. A femtocell connects to your broadband Internet service and uses it to communicate with your carrier’s cellular network. A phone that’s within range of the femtocell (typically seven to 10 meters) will connect to it and treat it as a cell tower. Femtocells have some significant limitations that impact business users: they are carrier-specific, so they only benefit users who use the same cellular provider as the business’ femtocell. They have a fairly low maximum capacity, usually between eight and 16 simultaneous users for a business-class femtocell. The femtocell uses Internet bandwidth, which will slow down Internet speeds for other devices. And, in most cases, the owner of the femtocell must authorize each specific cell phone number that is allowed to connect to the unit. All of this means that improved cell service isn’t available to anyone who comes into the building. For businesses who count on improving cellular reception for employees on different cellular networks, their customers, or the general public, a femtocell is less than an ideal solution. 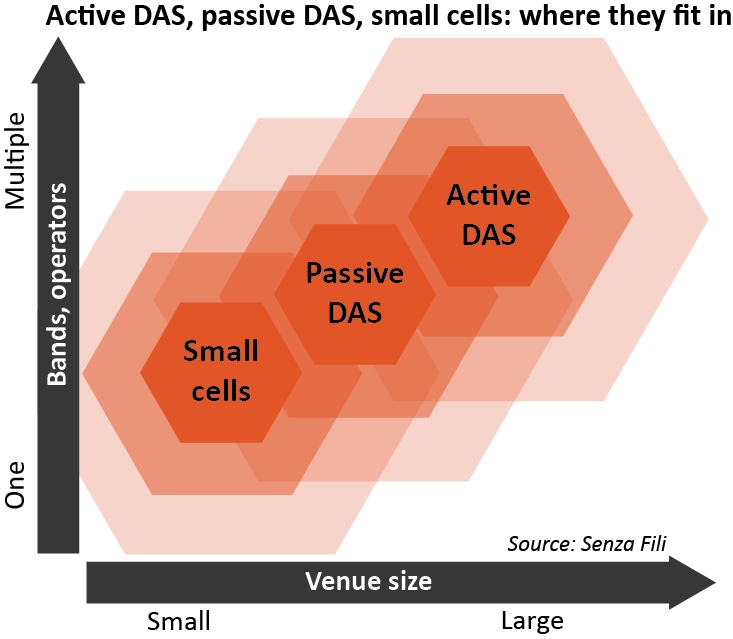 Using a passive distributed antenna system (DAS) for your small business overcomes all the limitations of a femtocell: cellular amplification systems are carrier agnostic, providing improved cellular reception to any device, regardless of its cellular provider. Commercial passive DAS are also designed to handle heavy user loads. They don’t rely on an Internet connection; instead, they use a small, roof-mounted antenna to communicate with the carrier’s strongest nearby tower. And a passive DAS system doesn’t require a login or special permissions—any phone in the system’s coverage area will automatically connect to it and start seeing improved signal immediately. Your best solution for getting improved cellular coverage in your business is a custom-designed and installed WilsonPro passive DAS, or cell signal booster system. With a custom design, you’ll get the maximum possible signal coverage with the right number of inside antennas. A professional installer will come to your location and implement your solution, following all commercial building codes. And the installation for a small business can usually be completed in a few days or less. Powerful Signal, a preferred WilsonPro provider, has been installing cellular passive DAS systems in businesses, small and large, for over ten years. For a competitive quote on a custom-designed, business-class WilsonPro cell signal solution, contact Powerful Signal at WilsonProWay.com or PowerfulSignal.com.